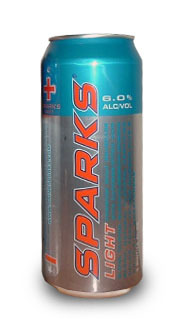 Sparks is one of the first energy drinks to contain alcohol and is marketed as a "malt beverage". Its active ingredients caffeine, taurine, and ginseng are common to energy drinks; however, its additional focus on alcohol is not. Other similar "malternatives" that also proclaim energy enhancement include 3SUM. Its packaging states a 6% alcoholic content by volume, higher than most American beer (commonly 3-6%). Its flavor is similar to standard energy drinks such as Red Bull, Monster Energy, and Rockstar, with a tart, citric, sugary taste. Sparks is currently available in 16oz silver cans with bright orange tops, with a "+" printed near the top and a "-" printed near the bottom, to give the can a battery-like appearance. A diet, or "Sparks Light" version, with a bright blue top, is also produced. A higher alcohol version (7.0%) called "Sparks Plus" is available in both 16oz and 10oz cans and has a black top.